Currently, all of Ford’s incoming and outbound vehicles are processed through Durban Harbour’s Roll On Roll Off (RORO) Terminal, which is the country’s primary import and export hub for most original equipment manufacturers (OEMs), importers and distributors. “We are experiencing unprecedented demand for the Ford Ranger around the world, and have invested over R3-billion in the recent expansion of our production capacity in our South African operations to fulfil these orders,” said Ockert Berry, VP Operations, Ford Middle East and Africa. “Together with Transnet, we evaluated how a multi-port strategy could benefit both parties by improving the use of current assets, reducing costs, avoiding the ongoing congestion in the Durban Terminal and utilising other ports for imports and exports,” Berry stated. To facilitate this process, Ford has broadened its outbound logistics portfolio to support the multi-port strategy for Port Elizabeth, and will be shipping vehicles twice per month to various receiving ports in Europe. The Ford Rangers, which are produced at Ford’s Silverton Assembly Plant in Pretoria, are being transported to Port Elizabeth using Transnet Freight Rail infrastructure. Traditionally, Port Elizabeth-based vehicle manufacturers transport units to Gauteng by rail, and these rail assets return empty. Ford will now be using the return leg to move export vehicles from Silverton to Port Elizabeth for shipping to selected markets around the world. “This will assist us in making the shipping and delivery from South Africa more cost effective, efficient and faster,” Berry added. The Transnet integrated logistics solutions across three of the operating divisions, to accommodate the Ford Motor Company launch exports units, allows for optimisation of strategic infrastructure, moving of cargo from road to rail and improving the efficiency of export logistics. 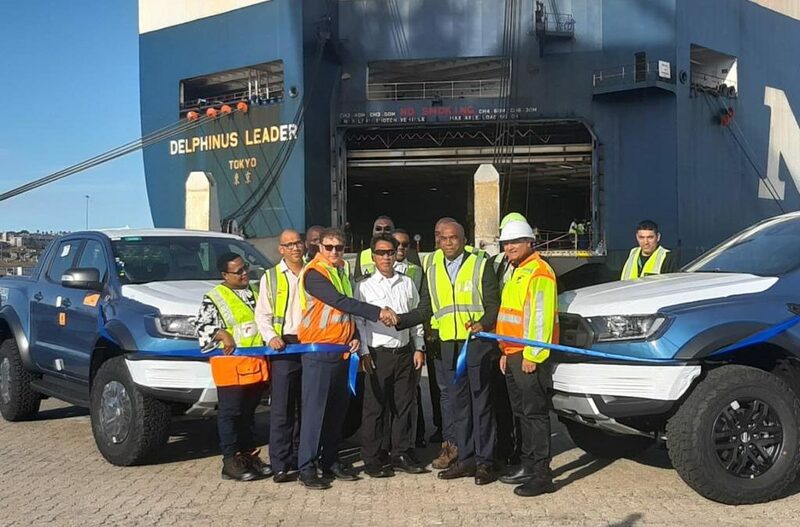 New multi-port strategy for vehicle exports from Port Elizabeth to complement current Roll On Roll Off (RORO) Terminal in Durban. First Shipment comprises 1000 Ford Ranger and Ford Ranger Raptor models destined for markets in Europe. Complements Ford’s recent investment of over R3-billion to expand production capacity at its South African vehicle and engine assembly plants.